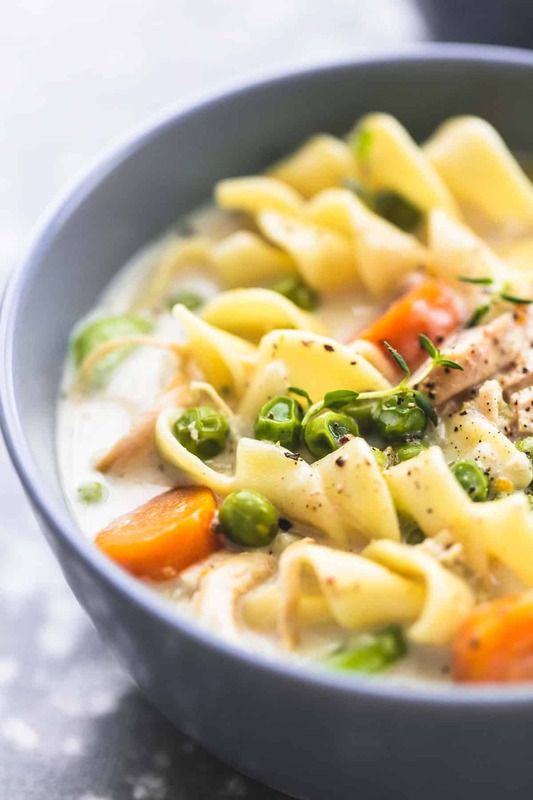 Slow Cooker OR Instant Pot Creamy Chicken Noodle Soup with the perfect blend of flavors makes a healthy, hearty meal made in the pressure cooker or crockpot! If you’re loving your instant pot, you’ve gotta try Instant Pot Balsamic Pork Tenderloin, Instant Pot Parmesan Chicken and Rice with Mushrooms, Instant Pot Chicken Marsala Soup, and Instant Pot Beef Bourguignon. Although the Instant Pot changed my life, I know that not everyone has jumped on board with it yet, or that some people might even — gasp — not like using one. That’s totally fine, I promise. That’s why I like to create these kind of dishes with both options in mind, because I want you to be able to make this recipe, even if you don’t have the exact, right tool. Either way you choose to cook it though, it can’t go wrong. Seriously, this recipe is so easy. And, with the weather cooling down nothing beats a nice, warm bowl of soup. 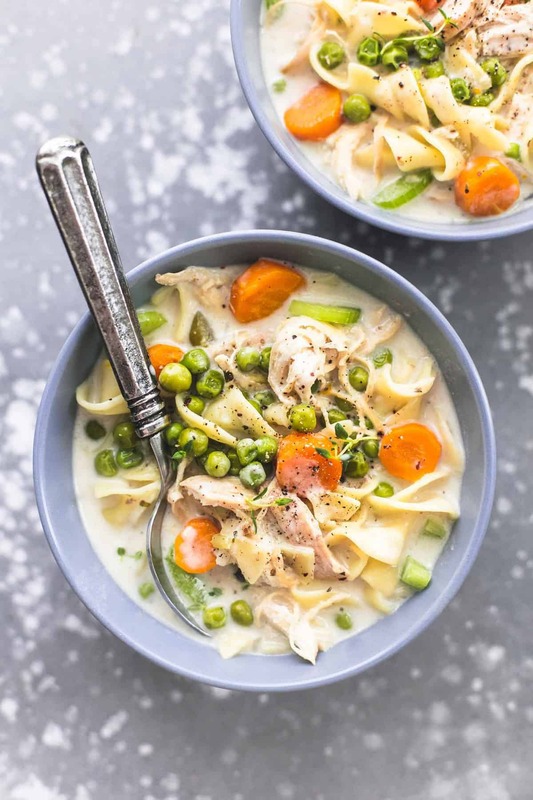 I know what you might be thinking: Another chicken noodle soup recipe? Come on. How many different ways can there be to prepare chicken noodle soup? And I’m here to tell you: many ways. But, I think you’ll agree that the bit of “creaminess” added to the broth with the heavy cream and then the flour-and-broth mixture really takes a boring, been-there-done-that-a-million-times soup and turns it into something guest-worthy! That is, IF you feel like sharing! 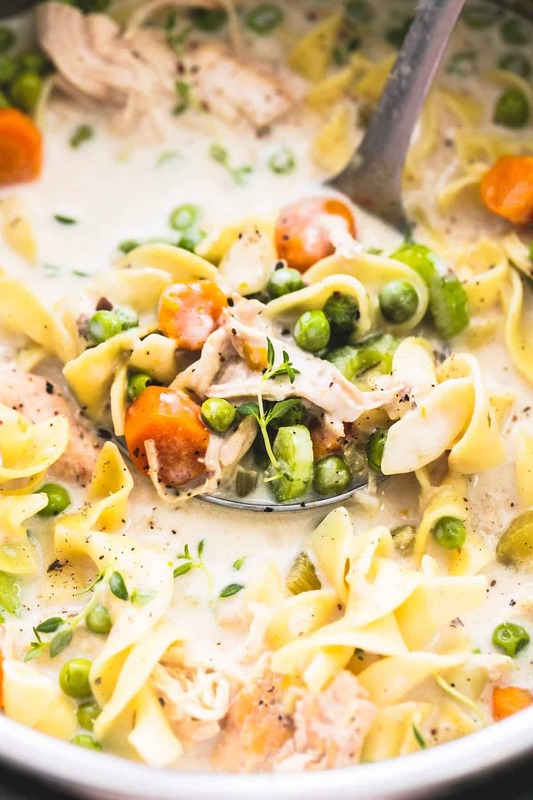 Plus, the addition of peas, carrots, and celery adds a little boost of nutrition to your typical chicken noodle soup. If you’re not familiar with the Instant Pot, let me tell you why I like it so much. Not only does it cook meals “instantly” (okay not really, but it cooks them pretty darn fast), but it also acts as a rice or slow cooker, a yogurt maker, a steamer, a saute pan, and more, all depending on which model you buy. So, if you are short on time or space (or both) then this gadget can help solve both problems at once. Granted, there is a bit of a learning curve to working the Instant Pot, but once you figure it out, you’ll love the slow-cooker “set-it-and-forget-it” aspect of the appliance, but with the “slow” part taken out. So if you don’t even have time to wait four to six hours for the slow cooker (or you forgot to put all the ingredients in before you left for work), don’t worry! You can add all the same ingredients to the Instant Pot and get your meal done in a fraction of the time. How Do You Make a Cream Sauce? For this recipe, I didn’t make a “true” cream sauce. Those involve making a roux with butter and flour together for awhile until other liquids can be added – in this case chicken broth. But, because this recipe is time-saving, I made a quick cream sauce by just whisking together flour with chicken broth and then adding the heavy cream. You still get the benefits of a cream sauce, but without all the work and heaviness of one you might typically find. You can get a better idea of how I make a true cream sauce in the directions for this Easy Creamy Macaroni and Cheese. Can I Put Frozen Chicken in the Slow Cooker or Instant Pot? Yes! You absolutely can. I don’t always remember to thaw out the chicken, either. You just have to allow for more time for the chicken to cook if you put it in frozen. Not a lot of time – only 10 extra minutes in the Instant Pot or one extra hour in the slow cooker. Not bad, and almost reason enough to “forget” to thaw the chicken all the time! Oh, side note: One trick I like when working with frozen chicken is that it’s much easier to cut evenly. So, let’s say you have frozen chicken, but you want to have the chicken pre-cut into cutlets or smaller pieces before it’s thawed or cooked. Try it for yourself, cutting chicken while it’s frozen is SO MUCH easier. 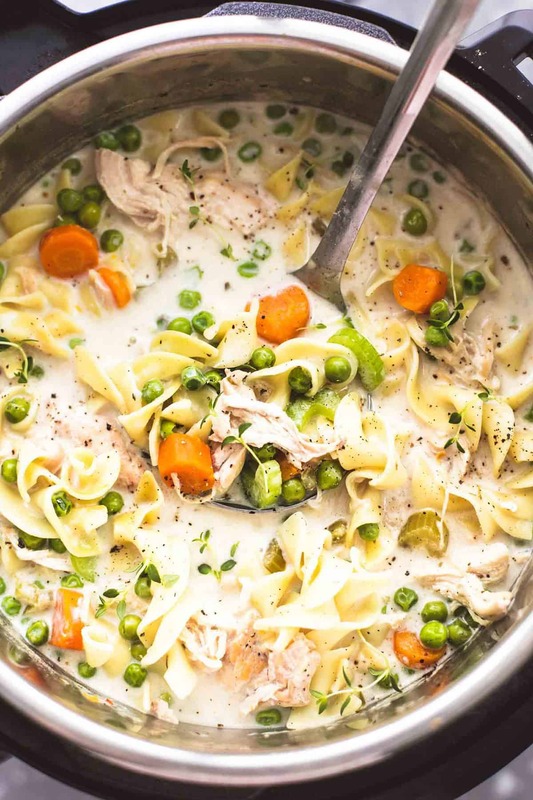 Place chicken in instant pot and add 7 cups chicken broth, garlic, oregano, rosemary, carrots, and celery. Add salt and pepper to taste. Cover and set to pressure cook for 15 minutes if using thawed chicken, 25 if using frozen. Natural release for 10 minutes, then use quick release to let the rest of the pressure out. Uncover, set to "soup" setting and shred chicken with two forks. In a medium bowl whisk flour into remaining 1 cup chicken broth. Stir in heavy cream. 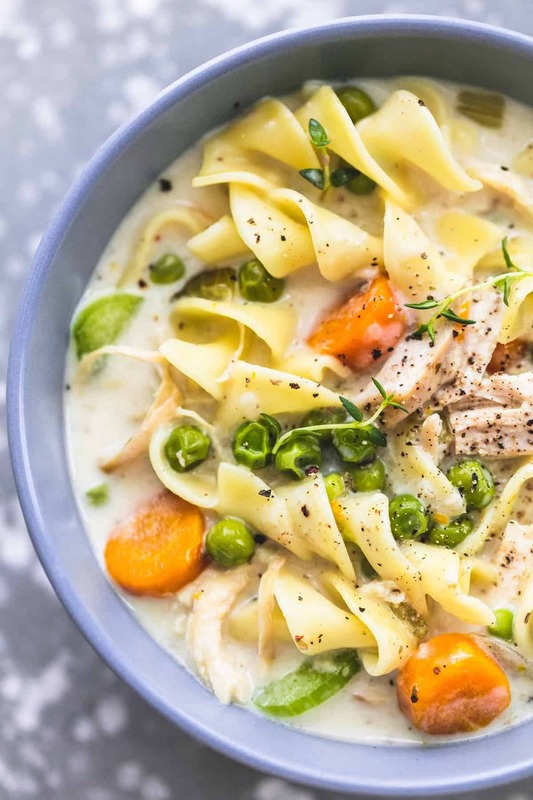 Pour into instant pot and stir in peas and noodles. Once soup is bubbling, cook for about 5 minutes longer or until noodles are tender. Taste, add salt and pepper as needed, garnish with fresh herbs if desired (such as thyme or parsley) and serve. Place chicken in slow cooker and add 7 cups chicken broth, garlic, oregano, rosemary, carrots, and celery. Add salt and pepper to taste. Cover and cook on high for 2 hours (for thawed chicken, 3 for frozen) or low for 6-8 hours. Uncover and set to high (if it was on low). Shred chicken with two forks. In a medium bowl whisk flour into remaining 1 cup chicken broth. Stir in heavy cream. 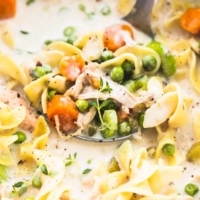 Pour into slow cooker and stir in peas and noodles. Cover and cook (on high) for 30 minutes longer, stirring occasionally. Taste, add salt and pepper as needed, garnish with fresh herbs if desired (such as thyme or parsley) and serve. Truly enjoy your creations ! Any idea how many calories are in the chicken noodle soup? Hi Jen- I recommend using My Fitness Pal. They have an online tool where you can input any recipe URL into and it will generate the nutritional information for you! Hi Jen- I don’t have it calculated but I recommend using My Fitness Pal. They have an online tool where you can input any recipe URL into and it will generate that information for you! according to my calculations, it was about 429 calories for 1/8th of the pot. I made this tonight and it was delicious! Where and when does the onion powder get added? Hi Janice! Thanks for pointing that typo out. I will get if fixed! It should go in with the oregano in step 1! I am excited to hear that you loved this soup!! I noticed the same thing. Instead, I just added chopped onions along with the carrots and celery, to make a mirepoix. I’m unsure why this wasn’t a part of the original recipe, in the first place. THe author may not like onions. It is look very delecious. I will must try this. It is very easy to cook. Thanks for sharing. I made this tonight in the crock pot. I think it needed about four hours instead of two because the carrots and celery were still pretty crunchy after the 2.5hours. Then when I added the cream and noodles, after 30 minutes, the noodles were like glue. because I have an all clad crock pot, I could put the pot on the stove for about 15 minutes, and that did the trick for cooking the noodles and thickening the soup (which wouldn’t thicken in the crock pot). but the flavor was good. I think I would use half the cream next time. Sara- thanks for your feedback! Should the noodles be cooked before putting in the crocK-pot? Or will the noodles cook in the crock-pot with the thickened broth? The recipe looks delicious! You can add the noodles uncooked in the slow cooker… it’s listed in step 3! WHOA this looks amazing! Definitely going to add it to the rotation to try in the next couple of weeks! You can- the heavy cream is just suggested because it will make it that much creamier! Sooo good! I made this for my in-laws and they loved it! I just went extra on the seasonings. Thank you!!! I love freezing this- I’ve the done the same!! Thanks for your feedback, Marsha! Happy to hear that you enjoyed this soup so much! I’M NOT SURE I UNDERSTAND STEPS 1 AND 2. DO WE PRESSURE COOK A TOTAL OF 30 MINUTES? DO WE REMOVE THE LID AFTER THE FIRST STEP AND THEN STIR AND REPLACE THE LID FOR THE NEXT 15 MINUTES IN STEP 2? THANKS SO MUCH FOR THE CLARIFICATION. Sorry- that was a typo! It is fixed now. It was just a repeated sentence!